A kayaker on Tuesday reportedly survived a great white shark attack at a beach in Pacifica just outside San Francisco. The teeth marks say it all. Pacifica kayaker Micah Flansburg knows he's lucky. He was kayaking near the point off of Linda Mar Beach with a friend. "And there was a huge explosion of water behind me and I instantly knew something just wasn't right," Flansburg said. And he also instantly knew he was looking at a great white shark. "It was, it looked just like the Discovery Channel. Shark's eyes were rolled up in the back of his head. I saw his gums and all his fangs bared. His whole head was halfway out of the water," Flansburg said. The great white clamped its sharp teeth into the kayak's plastic and started thrashing it around. "I was literally hanging on for dear life," Flansburg said. For 10 seconds, the shark battled the kayak. "It was sucking the boat under. Ripping it all around and I was just hanging on," Flansburg said. "When it let go. 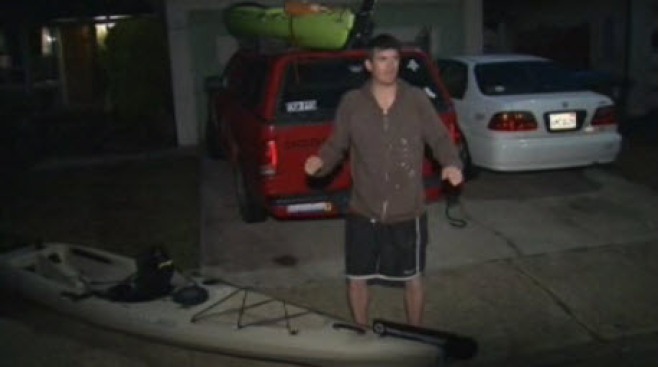 It did a big circle around my kayak and I thought it was coming in to get me again." But the shark swam away. Flansburg knows it could have been much worse. But he lived to tell the tale. "It was half shock. And just kind of elation," he said. "The biggest fish story you could ever tell is getting attacked by a great white shark. It just never happens."